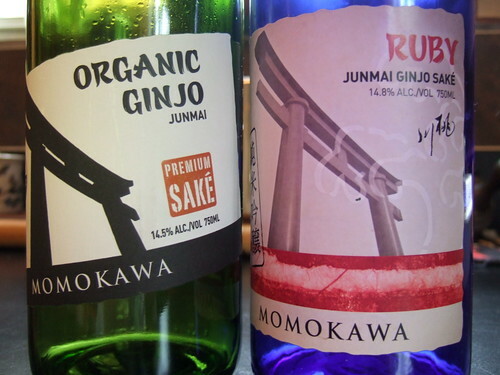 Photo: Momokawa Organic Ginjo (junmai) and Momokawa Ruby junmai ginjo. A few weeks back when I tried the Momokawa Organic Ginjo the weather was still chilly here in the Washington, D.C. area. We (the tasting team here at You, Madam) were sitting outside, not so much because it was comfortable outside but more in hope of luring warm weather. I was ready to discover a summer sake. And then I got the long sour aftertaste which kills this one for me. It has a faint nose with a super light palate that is refreshing, but then the finish skews bitter/sour. Strange. I certainly think using organic rice is a worthy enterprise. I am out at my local farmer’s market every week, I try for local and if something is also organic, all the better. But sake is one of those unique products that overcomes my delicate eco sensibilities in my need to quench my thirst, so that domestic organic label really needs to represent something delicious to sway me. I read an interesting article by Melinda Joe about Japanese organic sake in the Japan Times, but it made me wonder about the rice SakéOne normally uses to brew its sake. Is that rice normally grown with pesticides and petroleum-based fertilizers? Is it local rice? I’ll try to get some answers and report back. If anyone has any insights on Japanese rice growers, organic sake, or Issac Titsingh, please do share. We drank a bottle of Momokawa Ruby with a dish of pasta with sardines, bread crumbs, and capers (from Mark Bittman in the New York Times). The Ruby had a great mouthfeel and paired nicely with the strong sardine and caper tastes. We drank the whole bottle…and ever since I have been trying to find the junk-mail envelope on which I wrote my notes. Let’s just say when it goes fast, we’re digging it. I remember it wasn’t as dry as the Silver and was free of the unpleasant nose of the Diamond. I’d pair this sake with grilled fish or even a steak (although I prefer to have one of my favorite yamahais with beef). Good news for me, Momokawa Ruby is another reasonably priced, reasonably good drinkin’ sake option. It’s an honor to follow your reviews and we do appreciate the unbiased comments and feedback. We’re a bit surprised about the note on the organic “…the long sour aftertaste…” as this is not a common flavor in the organic sake. It’s typically quite fruity with lush floral and tropical aromas that carry through a clean lingering finish. We sent the bottle so we’ll grab one from the same bottling and see if something unexpected occurred but note that this is not common in a sake that has received high praise and points in competition. Most recent bottling had Daiginjo like aromas, fruity flavors throughout. Amazing. Dewey, thanks for writing. I would love to hear more about the organic issue, where your rice comes from normally, how you source the rice for this sake. I am also going to revisit the Organic Ginjo just to see what was going on with that finish. It was definitely a very long finish, but my perception of it was sour. I didn’t find it “lush” upfront, although there was a lot going on. The Diamond and the Organic Ginjo started one way and finished another, so perhaps I am reacting to that. Our rice is grown in the Sacramento Valley of California and as you may know, none of the great sake rices are grown in the U.S. It’s our only true limitation. So our Organic rice is a CalRose, a fairly simple rice but one that is quite hard and polishes beautifully. It also brews far better than our other certified Organic rice options (used by those who ship rice to Japan, brew Organic sake and ship it back to the US -that’s a whole other another “Green” issue). On any account, your review is based on your experience with that bottle and we do greatly appreciate unbiased comments such as yours. To have someone with such solid sake experience taste and comment is terrific and helps your Oregon sake brewer look ahead with our efforts. Dewey, I see exactly what you are saying about shipping rice to Japan and sending sake back not being particularly green. That’s why I’m so interested in the idea of the American rice. I keep wondering if there is a particular reason sake rice can’t be grown in the U.S.—wet paddy cultivation, proprietary rice, etc. One more review, plus a general discussion of your products to come. This has been a very educational and I am grateful to you for challenging me. Madam, There is a little Nipponbare and Akita Komachi grown in the US and attempts have been made with Yamadanishiki in recent years. The challenge in the US is that there are so few breweries here (5 in total) and seemingly little interest in better brewing rices outside of our own requests. Rice in the US is grown for eating and with that much is exported to Japan and other parts of the Pacific Rim. The issue for Yamadanishiki is that it grows tall and matures later than most strains grown and in the Sacramento Valley and that runs high risk of the late season winds knocking the stalks down before they are ready. Certainly there are pockets where better rice can be grown but it then requires a grower who is committed to the challenge and the potential risk. So far not growers have stepped up. There is better steady revenue in the mass-market rice strains. The other challenge is USDA approval of the rice seed stock. If it is not already in the US it is a bit of a process to get it approved and into the states to begin growing. Rice is really the only thing that restrains us so we’d certainly love to have a grower take on better brewing strains. We see that some small plots are grown in the Vancouver BC area by a small brewer there so there is certainly a chance to do it in the US. If a grower is up to the challenge we’d sure like to talk to them. Our efforts with those strains available to us now have allowed us to experiment and find the best option for our needs and desires. We think we have it locked in and are now tasting the results as new batches are nearing bottling. It’s exciting to taste what is happening with the new rice and other changes in the Kura. We area also grateful for the challenge(s) that you pose. Oh my goodness, a sake lover is born. Please do try some premium Japanese brands (see here for one: http://youmadam.com/2010/06/20/shimeharitsuru-jun-junmai-ginjo/) And yes, old dusty sake not kept in fridges in the store should be regarded as suspect.